"I've been helping out basically most of my life," she said. Through a series of qualitative focus groups, the investigators asked the youth about medication management. They used semi-structured interviews to assess their responsibilities, medication knowledge, and more. The caregivers were part of the Caregiving Youth Project of the American Association of Caregiving Youth. Their mean age was about 15, and 71 percent were female. For physicians, greater awareness is the first step. "It is important for all physicians, regardless of specialty, to know that this population of caregiving youth exists. 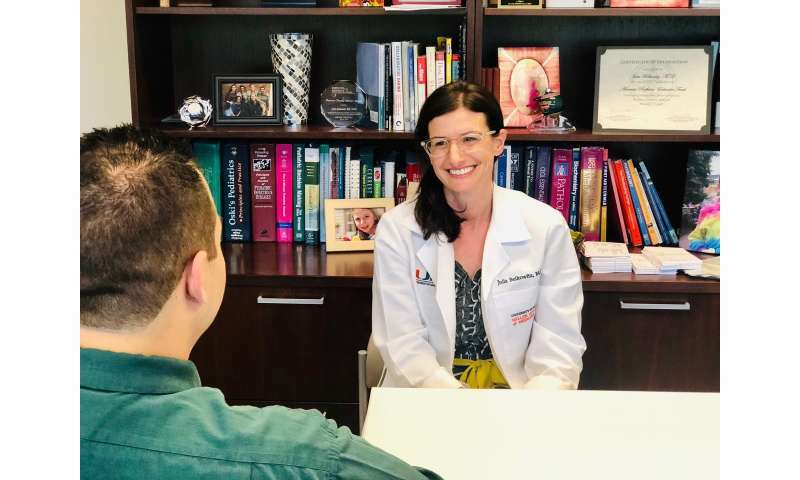 Physicians should take this into consideration when they are making plans for the care of their patients," said Dr. Belkowitz, who is associate professor of pediatrics. "One of the things we discovered in this study is that some of the kids reported that not only were they taking on the responsibilities of managing medications at home, they were actually the ones receiving the instructions directly," said Dr. Belkowitz. This finding underlines the importance of determining who is responsible for medication management. "The only way to do this is to ask." Proceed carefully, however. "It is important to know that some parents fear that if others know about the medication role and other caregiving responsibilities of their children that their families would be split apart, so these conversations need to be done in a sensitive and nonjudgmental manner." Several participants in the study reported difficulty understanding instructions, either written or as instructed in person by a health care professional. The data from this study also indicates that youth caregivers interact substantially with medical professionals, providing an opportunity for physicians and others to support them and recognize their contribution to the patient's well-being. "Back when my grandmother was walking, the doctor offered to help us with installing rails if we needed them," Destiny said. "And they said they would even install a chair in our shower so she could sit down and wash herself." "Once kids have been identified as caregivers, we need to ask them how they are doing," Dr. Belkowitz said. Inquire about challenges they face and what type of support they need to succeed in school, in their home environments and as caregivers. "We know from the literature that caregiving can have a significant impact on mental health and school performance of children and young people, and we have heard many stories of kids who have experienced physical injuries as well," she said. "Of course, we should use available screening tools and guidelines to identify children who may be suffering from conditions such as anxiety or depression." One in five youths said their caregiving made them miss a school activity or an after-school activity, 15 percent said it has kept them from doing schoolwork, and 8 percent said it has made them miss homework, according to a 2005 national survey. In addition, young caregivers said they missed school, "38 percent at least sometimes." Destiny has managed to find a way to balance caring for her relatives so that it does not detract from her school or social life. "I've learned to do really well with time management," she said. When properly supported, these children and teenagers can experience benefits such as pride and a closer personal relationship with their care recipient. Grandparents were the most common care recipients in the study, followed by parents and siblings. Other relatives, such as cousins and aunts or uncles, as well as unrelated people also relied on the youth for help with their medications. Neurologic-related diseases topped the list of care recipient conditions at 12, followed by diabetes at 7, and an equal number of people—4 each—with diabetes, functional decline/mobility loss, asthma, vision loss and other conditions. "What was also important about this study is that we were able to hear their perspectives directly from youth," Dr. Belkowitz said. "We learned that these kids take on multiple important responsibilities, often without formal education, surrounding their role." Destiny learned on the job. Her grandmother showed her which medicines she needs when to manage her Parkinson's disease. Her great-grandmother, diagnosed with Alzheimer's disease, did the same, until she passed away in September. An estimated 1.4 million children and teenagers between 8 and 18 years old help family members take their medicine and perform necessary activities of daily living, according to a 2005 survey by the National Alliance for Caregiving. Since then, experts believe the number of youth caregivers has mushroomed due to the aging of the U.S. population, the opioid epidemic, a shift toward more home care, and other factors. In terms of solutions, the researchers noted that teenagers are typically tech savvy and those with resources are closely connected to smart phones. Devising strategies to use this technology could be of great potential benefit for adolescents managing medications. That's precisely the advice Destiny would offer other youth caregivers. "Have reminders on your phone five minutes before it's time to give the medicine. That way you can prepare, get a cup of water, and sometimes they need to take it with food, so you need to grab a quick snack or cook something good." Many unanswered questions remain, including the current prevalence of caregiving youth in the United States. Future research could expand the age range to include children younger than 12. In addition, Dr. Belkowitz said, "We are currently looking at perspectives of pediatric health care providers about this issue and the impact of poverty on the role of children as caregivers." In the meantime, Destiny's grandmother recently progressed to an advanced stage of Parkinson's disease. "My grandmother is now on bed rest. She can't walk, talk or sit up for a long period of time," she said. "She has good and bad days. Sometimes I really can't understand her—and have to get real close to understand what she is saying. Other days are really good days, and she speaks in full sentences and laughs." Another piece of advice, based on experience, is telling care recipients that you will always be there to support them. "Constantly remind the person you're caring for that you love them and that you're doing this for them—that it doesn't bother you," Destiny said. She said her grandmother apologized once 'for being a hassle.' "That was really hard for me, because I don't want her to think that," Destiny said. "I do this for her because I want her to be taken care of." Always being there is the most important part, Destiny added. "It lets her know I'm willing to do whatever it takes to keep her well."